California Champagne, aka "Fred", is a rare sable champagne, with champagne dilution on a seal brown base coat. 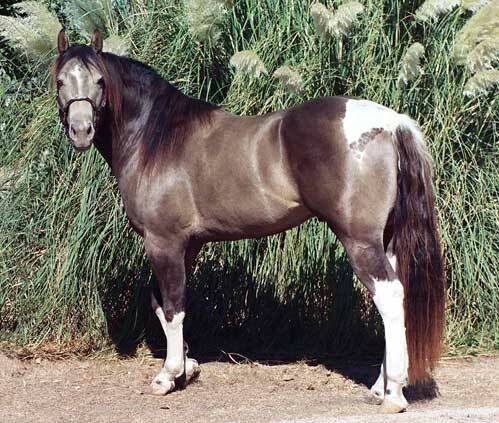 He is also homozygous for the tobiano spotting gene and homozygous for black too. He will produce black, brown, classic champagne and sable champagne foals when crossed to black mares and bay and amber champagne when crossed to non-black, non-dilute mares. Many thanks to Carolyn Shepard for sharing with us this photo of her very special stallion. He is standing at stud at Rancho No Robles.